Just because Jakarta Special Region is a busy city, doesn’t mean it is not suitable for travelers. 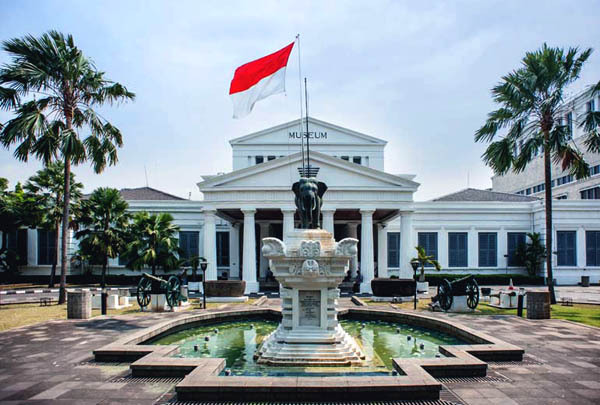 Featured by numerous interesting museums, Jakarta is chosen as one of the best vacation destination in Indonesia. Here is a reference. The name is National Museum and it is located in Medan Merdeka Barat 12 Street. The location is quite accessible as it resides in front of Monas Bus Stop. That means tourists can reach the building easily by bus. Once they get in the museum, they would be mesmerized by historical collections from various eras. It is definitely a recommended spot for a family vacation. When it comes to nuance, National Museum is considered serene and beautiful. There is a reason why it is also called Gajah (Elephant) Museum. As the name suggests, a statue of elephant resides majestically in front of the building. It is situated on a foundation and surrounded by a pond. On each side of the area, there is a statue of cannon! Not to mention some plants beautify the yard of the museum, adding a comfortable nuance to the location. The color of the building is white and it applies the Dutch and Art Deco architecture. The question is what people can enjoy in National Museum. In a nutshell, the building becomes the home of educative history and culture, so the guests are able to learn a lot there. To be exact, there are about 141,899 items stored in the museum. These include 7 different collections of ceramics, primordial items, pre-history objects, and much more. The fact is that Gajah Museum becomes the biggest and a complete museum in Southeast Asia. It displays collections from almost all eras. No wonder, the guests can learn about other cultures by exploring it. Once tourists enter the museum, they will be presented by various fossils, old weapons, ceramics, statues, inscriptions, and other valuable items, coming from all over regions of Indonesia. For those who love history and culture, the museum is indeed their heaven. Even the world has acknowledged it as a worthy vacation spot in Asia! Usually, foreigners come to the museum to witness a collection of ceramics, coming from Ming, Tang, and Han Dynasty. Those objects are indeed beautiful! This explains why some guests carry a camera when entering the museum. As for tips, it is better to come to National Museum between Tuesday and Sunday. It is because the place is closed on Monday and holidays. For kids, the ticket fee is cheaper than adults. Also, the museum is quite crowded on weekends, as many families come to the location with their kids. For many, it can be quite uncomfortable, so they must visit during working days. The location is in Central Jakarta. That means travelers only need to take a Trans Jakarta Bus to Medan Merdeka Barat 12. They need to take Harmoni route, though. Once they get to Harmoni Shelter, the next route is Blok M – City. The last destination is National Monument Bus Stop. That’s it.